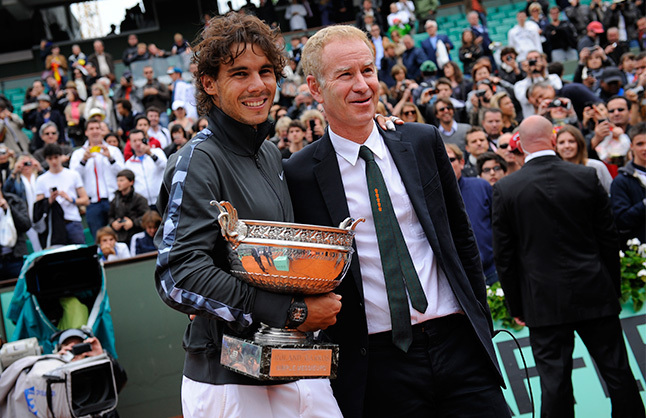 Nadal poses with John McEnroe after winning his record 7th French Open title. Rafael Nadal continued his dominance on clay with a record 7th French Open title. He beat world number 1 Novak Djokovic in a tough four setter 6-4, 6-3, 2-6, 7-5 to claim the title. The win also makes Nadal the most crowned man in the open era history at French Open. Like most of the grand slams over the past few years, this year too we saw the top three making it to the semis. Djokivic dismissed Federer in the semis to set up a mouthwatering encounter with the defending champion in the finals. The final was a brilliant spectacle with some blazing tennis from both the players but in the end the consistency of Nadal proved too much for the world number 1. Sharapova beat Sara Errani 6-3, 6-2 in a one-sided final to claim the French Open crown. This was a sweet victory for Sharapova who in the process also regained her top spot in the rankings. This was a great comeback from the champion who went through a major surgery in 2008 in a bid to save her career. Maria joined the elite list of women’s tennis with this win as she completed her career slam. Mahesh Bhupati and Sania Mirza won the mixed doubles crown beating Klaudia Jans-Ignacik and Santiago Gonzalez 7-6 (7-3), 6-1 in the finals. The pair won their second title together, with their previous win being in the 2009 Australian Open. Commonwealth games (CWG) just concluded in Delhi with a grand closing ceremony earlier last week and India had pulled it off after being in the news for all the bad reasons. All in all a great games for the Indian contingent as they finished second in the medals tally just edging England out. The games was special for lots of athletes none more so than Somdev Devvarman who got the first gold medal for an Indian tennis player in CWG. Even though the top players from Australia and England did not make it to the CWG 2010, it was a fantastic effort from the Indian. 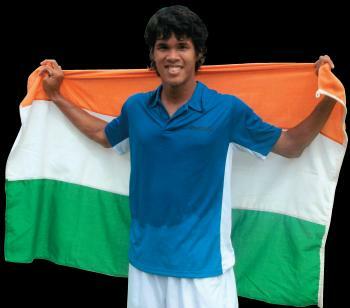 Somdev had a great year where he led India to the world group with a brilliant win over Brazil and also broke into the top 100 in the ranking for the first time. Sania Mirza too brushed aside her lackluster year to come up with an inspired performance in the games. Sania played very well throughout only to lose to the top seeded Australian Anastasia Rodionova in thrilling 3 set match in the finals to settle for the silver. Somdev though did not have such troubles as he coasted to a comfortable straight set victory over Greg Jones of Australia to claim the gold medal. It was a good CWG 2010 for the Indian tennis team as they won at least one medal in each of the disciplines. Sania also won the bronze in the women’s doubles playing with Rushmi Chakravarthy. The biggest disappointment though was the performance of the Indian star doubles pair of Leander and Mahesh as they ended up with just the bronze medal. Lot was expected from this pair as it was touted as their last time playing together. Leander and Mahesh were the favorites to take the gold this year but it was not to be. They lost in the semis to Australia’s less fancied pair of Paul Hanley and Peter Luczak. The other shock was the loss of Leander Paes and Sania Mirza in the quarters which deprived India of another medal in tennis. But overall this was a good return for India as they ended up with 4 medals in this year’s game and Somdev’s gold made is all the more special. Hopefully Somdev goes from strength to strength from here and has a great year ahead. It is sad to see that Leander and Mahesh will not be playing together anymore but for all these years they have kept the country’s hopes alive. I hope that they continue to play for team India in Davis Cup.